One of the UK’s largest independent importers and wholesalers of flat pack furniture has expanded into an historic Wolverhampton building, in a deal arranged by chartered surveyors Bulleys. Seconique paid an undisclosed sum to purchase the 450,000 sq ft building off Wobaston Road for its headquarters, warehouse and trade showroom, housing around 100 staff. The building used to house the Boulton Paul Aircraft company – manufacturers of the World War II Defiant bomber – and to mark this heritage Seconique has renamed the building as Boulton House. Bulleys is now marketing a surplus unit of 60,000 sq ft with a large yard at the site on behalf of Seconique. James Bird, senior associate at Bulleys, said: “The Wobaston Road property is a major acquisition as there are only a limited number of buildings of this size and nature. “It wasn’t easy to find a building of that size and took a while to achieve the sale, but we have worked closely with Seconique over the past few years and are delighted to have acquired this building for them. 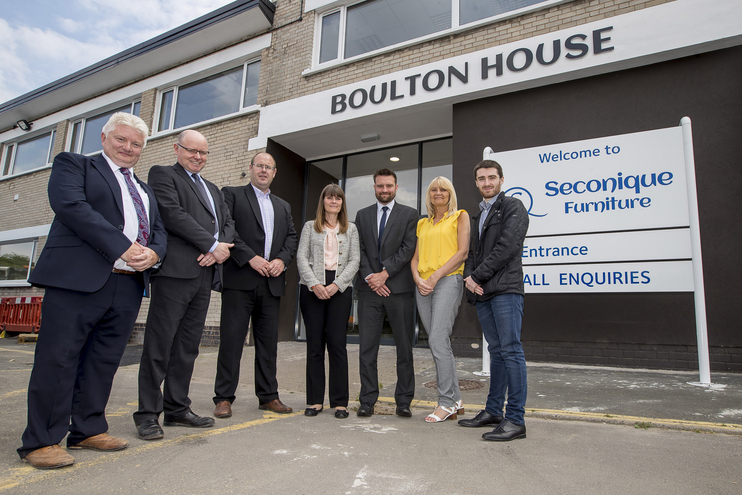 Seconique, founded in 1986, has moved around 100 staff to Wobaston Road site from its previous premises in Wednesbury, and expects to recruit more in the next few months as its trading expands. Helen Barker, managing director of Seconique, said: “After a long period of renting we felt it was time to purchase our own property, and the site at Wobaston road offered the size we required. “As well as allowing us space to accommodate other business tenants there is also room for us to expand in the future. “The new site is ideal as we have been able to redevelop the site to suit our specific needs and have created a better working environment for our staff. “We’ve also been fascinated to be approached by older local people who used to work for Boulton Paul, and they’ve shown us photographs of how the factory used to be which we have had framed and put up around the building. The property is on a 17.5-acre site between Codsall and Pendeford in north west Wolverhampton, just two miles from Junction 2 of the M54. Bulleys arranged the purchase from Cushman & Wakefield, with Ansons acting for Seconique, and the Allied Irish Bank providing finance. Pic cap (from left): Bartley Finnegan and Brian Hammond, both Allied Irish Bank, Philip Jones, chief financial officer, and Helen Barker, managing director, both Seconique, James Bird, Bulleys, Angela Richardson and James Owens, both Seconique.